Rubblizing of concrete pavement. Existing concrete pavement is broken into gravel-sized particles. Any steel reinforcing is removed, then the remaining gravel-sized particles are compacted and overlaid with asphalt pavement. Cold in-place recycling. Bituminous pavement is ground or milled into small particles. 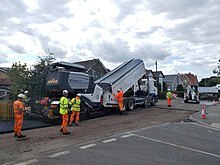 The asphalt millings are blended with a small amount of asphalt emulsion or foamed bitumen, paved and compacted, allowed to cure for seven to ten days, then overlaid with asphalt. Hot in-place recycling. 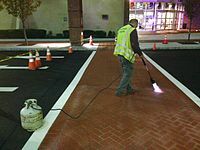 Bituminous pavement is heated to 250 to 300 °F (120 to 150 °C), milled, combined with a rejuvenating agent or virgin asphalt binder, and compacted. It may then be overlaid with a new asphalt overlay. This process only recycles the top two inches (50 mm) or less, so it can be used to correct rutting, polishing or other surface defects. It is not a good procedure for roads with structural failures. It also generates high heat and vapor emissions, and may not be a good candidate for built-up areas. Full depth reclamation is a process which pulverizes the full thickness of the asphalt pavement and some of the underlying material to provide a uniform blend of material. A binding agent may be mixed in to form a base course for the new pavement, or it may be left unbound to form a subbase course. 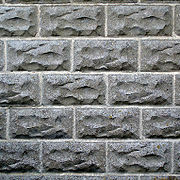 Common binding agents include asphalt emulsion, fly ash, Portland cement or calcium chloride. It can also be mixed with aggregate, recycled asphalt millings, or crushed Portland cement to improve the gradation of the material, and can provide a design life cycle of 30 years with proper lab testing and field verification. 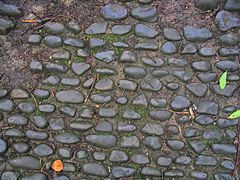 Gravel is known to have been used extensively in the construction of roads by soldiers of the Roman Empire (see Roman road) but in 1998 a limestone-surfaced road, thought to date back to the Bronze Age, was found at Yarnton in Oxfordshire, Britain. Applying gravel, or "metalling", has had two distinct usages in road surfacing. The term road metal refers to the broken stone or cinders used in the construction or repair of roads or railways, and is derived from the Latin metallum, which means both "mine" and "quarry". The term originally referred to the process of creating a gravel roadway. The route of the roadway would first be dug down several feet and, depending on local conditions, French drains may or may not have been added. Next, large stones were placed and compacted, followed by successive layers of smaller stones, until the road surface was composed of small stones compacted into a hard, durable surface. "Road metal" later became the name of stone chippings mixed with tar to form the road surfacing material tarmac. A road of such material is called a "metalled road" in Britain, a "paved road" in Canada and the US, or a "sealed road" in parts of Canada, Australia and New Zealand. Decorative wavy pattern on La Rambla. Several design methods have been developed to determine the thickness and composition of road surfaces required to carry predicted traffic loads for a given period of time. Pavement design methods are continuously evolving. Among these are the Shell Pavement design method, and the American Association of State Highway and Transportation Officials (AASHTO) 1993/98 "Guide for Design of Pavement Structures". A mechanistic-empirical design guide was developed through the NCHRP process, resulting in the Mechanistic Empirical Pavement Design Guide (MEPDG), which was adopted by AASHTO in 2008,although MEPDG implementation by state departments of transportation has been slow. ^ Nehme, Jean (14 July 2017). "About Long-Term Pavement Performance". Federal Highway Administration. Retrieved 22 October 2017. ^ Raab, Robert (n.d.). "Long-Term Pavement Performance Studies". Transportation Research Board. Retrieved 22 October 2017. ^ "NUAE Geosynthetics Ltd. News: Project Scout Moor Wind farm" (PDF). NUAE. May 2007. Retrieved 2 November 2008. ^ Anon (June 1991). "Highway construction/ Ground insulation" (PDF). Styropor: Technical information. Retrieved 29 January 2010. ^ "Warm Mix Asphalt Technologies and Research". Federal Highway Administration. 29 October 2008. Retrieved 4 August 2010. ^ a b c Gerbrandt, Ron; Tim Makahoniuk; Cathy Lynn Borbely; Curtis Berthelot (2000). "Guidelines must be followed strictly – No exceptions" (PDF). Effect of Cold-in-place recycling on the Heavyweight Trucking Industry. 6th International Conference on Heavy Vehicle Weights and Dimension Proceedings. Retrieved 25 January 2009. ^ David Jones; John Harvey; Imad L. Al-Qadi; Angel Mateos (2012). Advances in Pavement Design through Full-scale Accelerated Pavement Testing. CRC Press. ISBN 978-0-203-07301-8. ^ "Concrete Pavement Restoration" (PDF). Archived from the original (PDF) on 17 April 2012. Retrieved 7 April 2012. 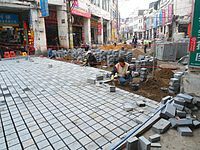 ^ "Concrete Pavement Rehabilitation Guide for Diamond Grinding". Retrieved 7 April 2012. ^ "Bellefontaine, Ohio: Court Avenue photo". City Profile. 17 February 2011. Retrieved 2 April 2018. ^ Lee, B. J.; Lee, H. (2004). "Position-Invariant Neural Network for Digital Pavement Crack Analysis". Computer-Aided Civil and Infrastructure Engineering. 19 (2): 105–118. doi:10.1111/j.1467-8667.2004.00341.x. ^ Kulsea, Bill; Shawver, Tom; Kach, Carol (1980). Making Michigan Move: A History of Michigan Highways and the Michigan Department of Transportation. Lansing, Michigan: Michigan Department of Transportation. OCLC 8169232. ^ Weingroff, Richard F. (7 April 2011). "The Lincoln Highway". fhwa.dot.gov. Federal Highway Administration. Retrieved 25 September 2017. The LHA also sponsored short concrete "Seedling Mile" object lesson roads in many locations (the first, built in the fall of 1914, was just west of Malta, Illinois). The "Seedling Miles," according to the LHA's 1924 guide, were intended "to demonstrate the desirability of this permanent type of road construction" and "crystallize public sentiment" for "further construction of the same character." Generally, the LHA worked with the Portland Cement Association to arrange donations of cement for the seeding mileage...The most famous "seedling" and one of the most talked about portions of the Lincoln Highway was the 1.3-mile "Ideal Section" between Dyer and Schererville in Lake County, Indiana. In 1920, the LHA decided to develop a model section of road that would be adequate not only for current traffic but for highway transportation over the following 2 decades. The LHA assembled 17 of the country's foremost highway experts for meetings in December 1920 and February 1921 to decide design details of the Ideal Section. They agreed on such features as: A 110-foot right-of-way; A 40-foot wide concrete pavement 10 inches thick (maximum loads of 8,000 pounds per wheel were the basis for the pavement design); Minimum radius for curves of 1,000 feet, with guardrail at all embankments; Curves superelevated (i.e., banked) for a speed of 35 miles per hour; No grade crossings or advertising signs; and A footpath for pedestrians. ^ Khazanovich, L.; Lederle, R.; Tompkins, D.; Harvey, J.T. ; Signore, J. (2012). "Guidelines for the Rehabilitation of Concrete Pavements Using Asphalt Overlays (FHWA TPF-5(149) Final Report)". ^ Moghadas Nejad, Fereidoon; Noory, Alireza; Toolabi, Saeed; Fallah, Shahab (8 August 2014). "Effect of using geosynthetics on reflective crack prevention". International Journal of Pavement Engineering. 16 (6): 477–487. doi:10.1080/10298436.2014.943128. ^ Lavin, Patrick (2003). Asphalt Pavements: A Practical Guide to Design, Production and Maintenance for Engineers and Architects. CRC Press. ISBN 9780203453292. ^ a b c "Asphalt Paving Principles". www.clrp.cornell.edu. Cornell Local Roads Program. March 2004. Retrieved 5 October 2016. ^ Budd, Godfrey. "An end to summer highway construction delays?". www.albertaconstructionmagazine.com. Retrieved 5 October 2016. ^ Gransberg, Douglas D.; James, David M. B. (2005). Chip Seal Best Practices. National Cooperative Highway. Transportation Research Board. pp. 13–20. ISBN 978-0-309-09744-4. ^ Lazic, Zvjezdan; Ron Gerbrandt (2004). "Feasibility of Alternative salt storage structures in Saskatchewan Neilburg case study" (PDF). Measuring performance indicators for decision-making in winter maintenance operations. 2004 Annual conference of the Transportation Association of Canada. Saskatchewan Highways and Transportation. Archived from the original (pdf) on 18 March 2009. Retrieved 25 February 2009. ^ a b "Highways and Infrastructure — Government of Saskatchewan". Archived from the original on 8 February 2008. Retrieved 15 April 2008. ^ Manins, Rosie (28 February 2009). "New dust suppression method". Otago Daily Times. Retrieved 5 November 2011. ^ Anon (July 1998). "Bronze Age metalled road near Oxford". British Archaeology: News (36). Retrieved 29 January 2010. ^ Anon. "Road metal". Merriam-Webster online dictionary. Merriam Webster inc. Retrieved 29 January 2010. ^ Anon. "Metal". Online etymological dictionary. 2001 Douglas Harper. Retrieved 29 January 2010. ^ Anon. "Metalled Road". World Web Online. WordWeb Software. Retrieved 29 January 2010. ^ "Surfacing Aggregate" (PDF). Product brochure. Afrisam.com South Africa. 2008. Archived from the original (PDF) on 18 March 2009. Retrieved 25 January 2009. ^ Oeser, Markus; Sabine Werkmeister; Alvaro Gonzales; David Alabaster (2008). "Experimental and numerical simulation of loading impact on modified granular pavements" (PDF). 8th World Congress on Computational Mechanics 5th European Congrss on computational methods in applied sciences and engineering ECCOMAS. 6th International Conference on Heavy Vehicle Weights and Dimension Proceedings. Archived from the original (PDF) on 18 March 2009. Retrieved 25 January 2009. ^ Mary C. Rukashaza-Mukome; et al. (2003). "Cost Comparison of Treatments Used to Maintain or Upgrade Aggregate Roads" (PDF). Proceedings of the 2003 Mid-Continent Transportation Research Symposium. Iowa State University. Retrieved 16 September 2011. 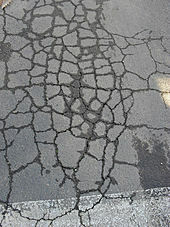 ^ "Roads to Ruin: Towns Rip Up the Pavement". Wall Street Journal. 17 July 2010. Retrieved 16 September 2011. ^ De balans opgemaakt: Duurzaam Veilig 1998–2007 [Sustainable Safety in the Netherlands - 1998–2007] (PDF) (in Dutch). SWOV, Dutch Institute for Road Safety Research. 2009. p. 6 (English abstract). ISBN 978-90-73946-06-4. Retrieved 13 July 2014. ^ Hembrow, David (25 April 2011). "Road noise, cobbles and smooth asphalt". A view from the cycle path. Retrieved 14 August 2014. ^ "Endurablend Systems for Color Surfacing - Colors, Seals, Textures and Protects to Extend Service Life of Asphalt and Concrete Pavement Surfaces" (PDF). Retrieved 13 November 2014. ^ High-Performance Crosswalks (PDF). 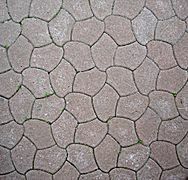 Alternative Paving Concepts. Retrieved 13 November 2014. ^ "Decorative Stamped Asphalt". ThermOTrack. Retrieved 13 November 2014. ^ Li, Qiang; Xiao, Danny X.; Wang, Kelvin C. P.; Hall, Kevin D.; Qiu, Yanjun (2011). "Mechanistic-empirical pavement design guide (MEPDG): a bird's-eye view". Journal of Modern Transportation. 19 (2): 114–133. doi:10.1007/bf03325749. ISSN 2095-087X. ^ "Scientists walk on tech pavement". BBC News. 12 September 2006. Retrieved 22 May 2010. ^ "The Value of Smooth". Better Roads. Randall Reilly. August 2011. 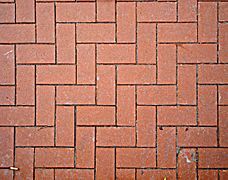 Wikimedia Commons has media related to Pavements.